When you own a fish tank, you want it to look its best, as well as be the best environment for your fish. The way you can achieve this is by properly maintaining it with the right products and by taking the right precautions. We have compiled a list of some of the best products you can use to maintain the look and cleanliness of your fish tank, as well as some awesome accessories, as a cherry on top. Keeping a fish tank clean can seem frustrating, especially if you are a new fish owner and you are not sure what you need to do. Fortunately, you can start to develop a system for cleaning and maintaining your tank that will make the whole process a breeze. Bringing the water in your fish tank to optimum levels involves the growth of healthy micro-organisms inside the tank, which will help to make the water safe for fish. Experts recommend letting the tank run on its own for about a week before adding fish to it. Oftentimes, when you purchase an aquarium at the pet store, it will come with a packet you can use to start the process of growing the right number of microorganisms that will build a balanced environment. You can also add a small amount of fish food to the tank to start the process of growing microorganisms within the tank. The most important thing to remember is to wait to add fish to the tank until it is ready, and the proper adjustments and precautions have been taken. A general rule of thumb is that you should never purchase fish and a fish tank in the same day. The fish tank will take time to get it to the point where it is ready for its inhabitants. Prior to purchasing a new fish, make sure you do your research to learn about the species, how big they will get, and which fish it will work well with. It is also important not to overcrowd your fish tank to avoid an unhealthy living situation for your fish. Some breeds of fish will also not get along with one another, so you need to make sure you do the proper research about which fish will interact best with one another during their time in your tank. Remember to only feed your fish once per day and do not feed them more than they can eat within a few minutes. Overfeeding is unhealthy for the fish and it causes the tank to get dirty, as well as leading to the possibility of disease. Even with taking the proper precautions, your fish tank will still inevitably get dirty, which is why you will need to maintain it with the proper products and cleaning techniques. Cleaning your fish tank does not have to be difficult and will be even easier to do once you have a schedule for it. Remember to clean the decorations and accessories, as these quickly get covered with algae. Keeping your fish tank clean will require some products to ensure you can keep it maintained. This fish tank cleaner floats inside your fish tank to easily glide around without sinking to remove algae in all areas of the tank. This net is vital for removing your fish from your fish tank so you can take the time to properly clean the tank. It contains soft nylon mesh to reduce the risk of your fish trapping its gills in the netting. This scraper uses an extra-long handle, which is perfect for scrubbing glass aquariums. It helps to remove unsightly algae from your fish tank without having to get your hands wet. 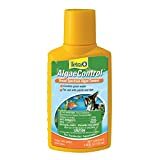 This product helps to combat aquarium algae, as well as helping to make sure it does not return. It is effective against all types of algae and one drop of the product will treat one gallon of water in a tank. 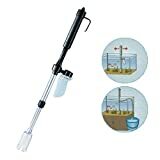 ღThe Aquaclean is a powerful 3 in 1 aquarium gravel cleaner, algae remover and water siphon. Since the Aquaclean is battery operated, it eliminates the possibility of electric shock. A simple push of a button operation. The side bag makes it easy to trap debris or simply attach a hose when a water change is needed. The Aquaclean is extendable up to 20" making it ideal for most aquariums. This cleaning product helps to clean gravel inside the tank, siphon fish waste and other dirt out, and spot clean around the tank. It is ideal for quick spot cleaning in between deep cleanings of the tank. Quickly removes unsightly algae from acrylic aquariums. 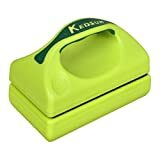 Durable scrubbing pad comes with hand-held control to clean nooks and crannies. For use on acrylic aquariums only. 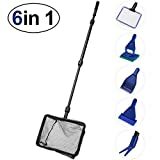 This pad will come in handy when it is time to do a deep cleaning on your fish tank, as it will effectively remove algae buildup from the sides of your fish tank. Its rough brillo-like texture will grip any algae on the tank walls and remove it quickly and efficiently. HAPPIER FISH with far fewer fish deaths. Now you can grow big, beautiful, mature fish. All natural and eco-friendly. JUST 2 CAPSULE IN MONTH is all it takes to the biological balance of 100 liters of aquarium water. Contains a high concentration of helpful microorganisms. Biological preparation BESEDER for use in aquariums, fish tanks and ponds, namely, for their CLEANING & REVITALIZING. These tablets contain enzymes that remove harmful nitrates and ammonia from fish tank water. Just two capsules per month is all it takes to keep the biological balance of the water in store and provide the microorganisms your tank needs to thrive. Make sure you read the instructions on the tablet package to make sure you are using the proper amount for the water level in your tank. PREVENT YOUR PETS FROM CONTAMINATION: Every aquarium owner knows how sensitive fish and aquatic life is. A direct contact of your skin with them or the water that they live in, might contaminate the water and cause its inhabitants allergic reactions. To prevent this unfortunate situation, use SunGrow Aquarium Gloves whenever you perform aquarium tasks, be it shifting the fish or just playing with them with your hands in water. PERFECT MATCH FOR SMALL AND MEDIUM-SIZED AQUARIUMS --- A unique blend of latex and PVC creates a durable waterproof exterior while a soft fine Cashmere lining provides a warm, comfortable interior. Please note that the purple part of the glove is not waterproof. The pair of gloves is perfectly fit for using in small aquariums ranging two to ten gallons. ARM LENGTH WITH SEAMLESS STITCHING & ELASTIC CUFF --- Keep your hands, arms and sleeves free from water with the extra long 19.6 inches (50 cm) SunGrow Aquarium Gloves with superior seamless stitching. A secure elastic cuff around the wrist of each glove ensures that the SunGrow Aquarium Gloves won't slide down or fall off while you are wearing them, adding even more protection from water and marine life. ANTI SKIDDING DESIGN FOR ADDED SAFETY --- The innovative anti skidding surface of the SunGrow Aquarium Gloves comes is very convenient when handling sensitive aquatic life such as coral, sea anemone and crustaceans. DIFFERENT ALTERNATE USES OTHER THAN AQUARIUM MAINTENANCE --- Beyond standard aquarium maintenance, the versatile SunGrow Aquarium Gloves are also useful for a variety of other household tasks such as hand washing your cars, cleaning the bathroom and dish washing. 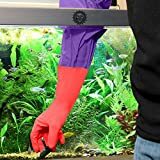 These extra-long gloves will come in handy any time you need to remove anything from your fish tank or clean it, as they will cover your entire arm. They have not been treated with any chemicals, so they are safe to use within the fish tank. Along with using these products mentioned above, there are also fun ways to accessorize your fish tank that can help to bring it to life and give it some flair. Think about the style you are trying to achieve and how you want your fish tank to look. There are thousands of products available on the market to help accessorize your fish tank, so have fun with it. Some of these products can also have practical purposes that will help you understand more about the function of the fish tank and when it needs to be maintained. This thermometer has a large, easy to read display with an easy to apply suction cup, so you can place it wherever you would like. It will help you keep track of the temperature of the water within your fish tank, so you can adjust as necessary, depending on the needs of your fish. 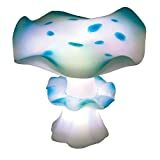 Tetra Wonderland Collection LED Color-Changing Mushroom, from $13.91 to $14.91. 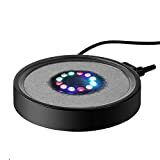 This light was designed for fish tanks up to 10 gallons and will automatically cycle all different colors of the rainbow or pause on the color of your choice. This can help to make the fish tank have a more fun and light appeal. Decorate your aquarium and bring it to life with the multi-color bubble generator. It is easy to operate and will help give your fish tank some personal style and flair. This faux anemone will help give your fish tank an appearance like the ocean floor, with soft material that is safe for your fish. Simply apply this fun jellyfish décor to the inside of your fish tank and watch it go! 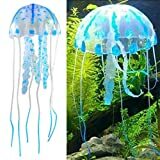 It imitates a floating jellyfish and even glows to bring some light and color to your aquarium. Keeping your fish happy and healthy can be easy when you properly clean and maintain their fish tank environment. The products we mentioned will help you develop a great system for keeping up with this maintenance schedule, as well as ensuring you take all the proper precautions for doing so. When you are considering accessorizing your fish tank, have fun with it and think about what objects fit whatever theme you are striving to achieve. The sky is truly the limit when it comes to building the fish tank that suits your interests, as long as your fish are properly taken care of in the process.